The site of the Homestead Room at first was a horse shed for farmers to use while they were shopping at the 1857 store built by John. J. Morrill. Later when the Grange owned the building the members converted the area into a room for members of the Junior Grange and for overflow seating during Grange suppers. 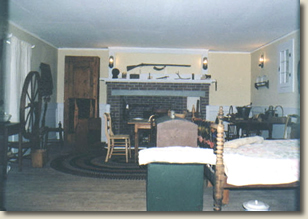 Still later, in 1996, when T-AHS was planning how to best use the building for museum displays, it was decided to create a setting reminiscent of a one-room family homestead to help visitors understand what it had been like for a family which was just beginning to carve a farm out of a wilderness setting.